In the recent weeks, the nation has been faced with shocking reports of sexual abuses against young people, including the case of a 14-year-old from Guatemala who had been held against her will by a businesswoman, who was slapped with a mere $10,000 fine after being convicted on human trafficking charges, here in Belize for literally enslaving the girl for sexual exploitation by grown men. On adjournment of the Special Sitting of the House of Representatives this afternoon, Belize Rural Central area representative for the Opposition People’s United Party, Dolores Balderamos-Garcia, spoke out against sexual predators who exploit children here in Belize, and also spoke out about allegations that have come to the fore against the Baptist preacher and principal, Norman Willacey. In response to her comments, Prime Minister Dean Barrow informed that the Commercial Sexual Exploitation of Children (CSEC) Bill is due to be introduced in Parliament in the next two weeks or so. Too much time had passed between the reporting of the incident last week and Willacey’s suspension, which only occurred yesterday, Wednesday, declared Balderamos-Garcia, a former minister responsible for Human Development. “It is a matter that we need to put on the table for national attention and call for immediate action and immediate suspension if there is a repeat of this kind of situation,” she said. “The protection of our youth and minors is of extreme importance and should not be put on any kind of backburner…,” she added. Education Minister Patrick Faber, Collet area rep for the ruling United Democratic Party, agreed. “I say without hesitation, we join with all those who have indicated that they believe that the Baptist management has indeed disappointed us in terms of the swiftness of how they are handling this situation,” Faber said. It was not the Ministry of Education’s fault, he went on to clarify. According to Faber, when the incident was reported to the Ministry, it moved quickly to contact the Baptist management to say that the report had been made and that they should move to deal with the matter accordingly. 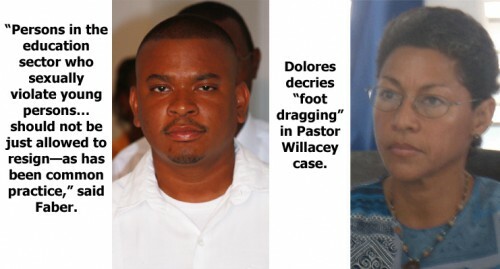 The management had reported that, in line with the relevant school/education rules, the Baptist management has suspended Pastor Willacy for 15 days, pending an investigation. Faber said that there must be due process in carrying out the investigation, and he asked Belizeans and the Belmopan community to be patient. He assured them, however, that when the Baptist High School opens on Friday, August 24, Willacey will not be there as principal. Faber, furthermore, frowned upon those managements of schools “who have sheltered some of these predators” and appealed to parents to realize that it is very important to report cases to authorities and deal with them appropriately, to ensure that those who perpetrate abuses are labeled and marked in such a way that they can never again have the kind of position that would allow them to interact with youth in a way that will damage them. Faber said that while it is not his place to tell the Baptist management how to deal with the Willacey case, since it appears that he has admitted to “messing around” with his 16-year-old student, a resignation will not be tolerated as a sufficient response. The Education Minister spoke today of another case in which a high school teacher is accused of fondling children. “I want to make it clear [that] those engaged in that kind of behavior cannot and will not be tolerated by Government and the Ministry of Education,” he commented. Persons in the education sector who sexually violate young persons, said the Minister, should not be just allowed to resign—as has been common practice; but swift and stern action should be taken against them to have them marked for life.